Our Cufflinks are made from highest quality pewter or silver and are the perfect finishing touch for any garment. Inspired by the elegance and arrogance of the Victorian and Edwardian aristocrat, from the classic era of the top hat and cravat pin. Our Buffalo Head Nickel Cuff links measure 1 inch in diameter and soldered to a solid brass cuff link. Cast in lead free pewter in the US. Our Celtic Silver Cufflinks embody all that is Irish with class and elegance. A perfect gift for that hard to buy for man. Our Miasmatic Reactor Core Steampunk Cufflinks are actually atmospheric purifying and energy extraction devices, designed to defend against the hazard of noxious air, as well as fine accents to your attire. OOur Empire Spur Gear Steampunk Cufflinks can demonstrate the advanced state of their existence through industrial exemplification, adding iconic gears to their state of elegant appearance and dress. Our Celtic Seahorse Cuff links measure 1 inch in diameter. The back is soldered to a solid brass cuff link. Hand cast in lead free pewter in the U.S. 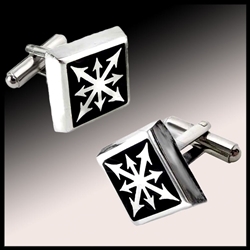 These Fleur de Lis Cuff links measure 3/4 of an inch in diameter, with the backs soldered to a solid brass cuff link. Cast in lead free pewter in the U.S.
Our Steampunk Clock Gear Cuff Links measure 15/16 inches in diameter. It's the details that make the difference, and these gear cuff links are the perfect finishing touch. These Steampunk Clock Gear Cuff Links measure 1 1/4 inches in diameter. Hand cast in the US from lead free pewter, these gears are then soldered to solid brass cuff links. The Steampunk Gizmo Cuff Links measure 13/16 of an inch each in diameter. Hand cast in lead free pewter in the US. Our Steampunk Watch Cuff Links offer the perfect finishing touch for any Steampunk look. 3/4 of an inch in diameter, these watch innards are soldered to solid brass cuff links. Hand cast from lead free pewter in the US. A pair of piratical death heads with crystal eyes, the Skull N Crossbones Stargazer Cufflinks are the perfect accessory to your formal wear when it needs a gothic touch! Our Phoenix Pewter Cufflinks measures 1 inch in diameter. The back is soldered to a solid brass cufflink. A phoenix is a mythical bird with a rich history; at the end of its life cycle the phoenix builds itself a nest of cinnamon twigs that it then ignites. These Skull and Bones Cuff links measure 3/4 of an inch in diameter. The back is soldered to a solid brass cuff link. Cast in lead free pewter in the U.S. These Skull Pewter Cuff links measures 3/4 of an inch in diameter. The back is soldered to a solid brass cuff link. Cast in lead free pewter in the U.S.
Our Tudor Rose Cuff links measures 1 inch in diameter. The back is soldered to a solid brass cuff link. It is cast in lead free pewter in the U.S. These Thistle Pewter Cuff links measure 1 inch in diameter, cast in lead free pewter in the U.S. The pewter pieces are then soldered to a solid brass cuff link. These Zombie Biohazard Cuff Links measure 3/4 of an inch in diameter. The backs are soldered to a solid brass cuff link. Cast in lead free pewter in the U.S.